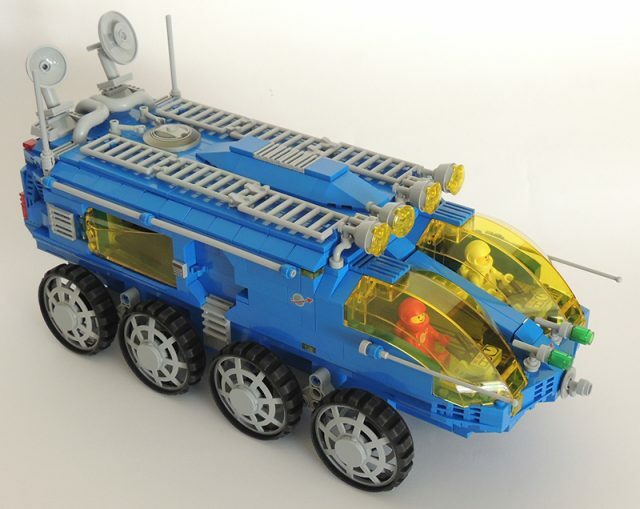 Brickshelf user (yes, Brickshelf still exists) legofrik has recently built a cute boxy rover in the colours of Classic Space. He says the inspiration was a coincidental discovery that small treads fit around 6×6 dishes to create a unique wheel design. The build has a very boxy shape, and yet avoids looking rectangular and simple. The colours are not only blocked visually, but also by purpose; blue as the main bulk of the vehicle, gray for radars, hoses and other technical doodads and translucent yellow as the iconic Classic Space window and windscreen colour. The rover also has working suspension and a detailed interior. The treads/dish combo works really well for small rotors also!